Perhaps the quintessential Japan experience, onsen are hot spring baths that bubble up all over this volcanic archipelago. A popular recreational activity year round, onsen take on new levels of wonderment in the winter months. Slipping into a natural hot spring pool and feeling your worries melt away whilst surrounded by snowy, wintry scenes is an experience like no other. Just remember, you’ll have to shed any embarrassment you might have along with your clothes – onsen bathing in Japan is a strictly naked affair. There are many kinds of onsen, from isolated pools enshrouded in the forests of Hokkaido to hulking great bathouses in major urban centres. To find out more about the history and etiquette of onsen, read our blog post. With ample mountain ranges, reliable snowfall and solid infrastructure, Japan is Asia’s foremost destination for winter sports. Skiers and snowboarders the world over flock to Japan to take advantage of exceptional conditions, particularly to the northernmost island of Hokkaido. The jewel in the crown of this winter wonderland is Niseko United, an expansive ski resort encompassing four interlinked ski areas and featuring some of the best powder skiing in the world. Not only is the skiing and snowboarding here outstanding, it also features a number of uniquely Japanese quirks: the lifts are fitted with speakers blasting out J Pop, you can dine on a warming ramen or katsu curry at the mountain peak and an attendant will kindly brush the snow off the chairlift for you and offer you a deep bow before you take a seat. And after a hard day on the slopes, there’s just one way to finish it all off; an apres ski onsen. Here’s a wholesome Japanese winter activity that doesn’t involve scaling mountains or getting naked with strangers (unless it gets really out of hand). Gathering friends and family together and bonding over a nabe hot pot is a common pastime in the colder months and is an incredibly effective and sociable way of beating the winter blues. At the centre of the action is the kotatsu table, an ingenious invention which features an electric heater on its underside which is then covered in a blanket, ensuring all those who gather around the table are treated to nice toasty legs. The nabe pot then sits bubbling away on the table whilst fresh seasonal ingredients and stock are added. These parties are a great excuse to gorge on delicious healthy dishes whilst reinforcing ties between loved ones and have come to form a traditional image of winter in Japan. Find out more about nabe in our blog post, or try it yourself with our recipes. Hokkaido’s bustling metropolis of Sapporo holds the accolade of the snowiest city in the world. 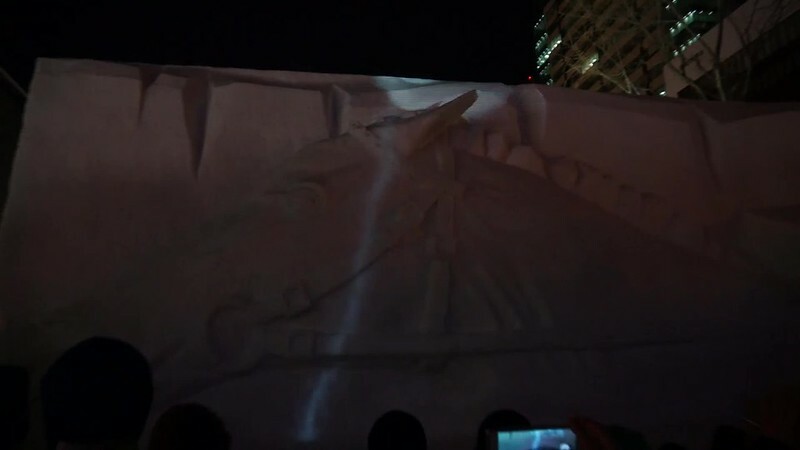 Rather than let it get them down, the fine citizens of Sapporo celebrate the natural abundance of the white stuff every February with the ‘Yuki Matsuri,’ or snow festival. This epic event has grown from students messing around in the 1950s to an enormous festival showcasing an incredible array of snow creations, from intricate sculptures of famous pop culture figures to ice palaces that look like they belong in a fantasy land. Not only is it a spectacular scene, but with an influx of around 2 million tourists the city comes alive with merriment, with performances from top musicians, amazing art shows and an abundance of food stalls serving international and Japanese street food favourites. This is a truly one off event that needs to be experienced to be believed. Read more about the city of Sapporo in our travel blog post. Japan’s distinctive winter conditions create some unusual natural phenomena which can be a sight to behold. In the Okhotsk Sea north of Hokkaido, great expanses of drift ice form across the water. By arranging to take a trip on the ‘ice breaker’ ships that cruise these waters, travelers can embark on the novel experience of sailing right through the drift ice, potentially even spotting seals and other wildlife on the journey. If a subarctic exhibition sounds a little too adventurous, consider a trip to Mount Zao on the border between Yamagata and Miyagi Prefectures. Here, strong winter winds and snow ensnare the evergreen conifers, creating spooky “snow monsters” that haunt the hillside. Eerily beautiful, the opportunity to ski besides these elaborate creatures represents a true ‘only in Japan’ winter activity. Finally, if you fancy seeing some altogether furrier snow monsters enjoying a bath, take a trip to Nagano, where you can be charmed by families of red faced Japanese macaques chilling out and warming up in the natural hot springs. What are your favourite winter activities in Japan? Let us know beneath in the comments, or get in touch on Twitter, Facebook or Instagram. Thanks to the good people of flickr for these images. Check individual image names for photo credits. Posted in Travel and tagged hokkaido, nabe, nagano, onsen, onsen japan, skiing japan, snow monkeys, snowboard japan, travel blog, winter activities Japan, Yamagata. Bookmark the permalink.